Radiology uses X-rays, magnetic waves and ultrasound to scan the inside of the body and obtain images. Doctors can then use those images to detect and diagnose illnesses and injuries, as well as to help develop treatment plans. The Radiology department of Desert Springs Hospital Medical Center is accredited by the American College of Radiology in ultrasound, MRI, nuclear medicine and CT Scan. Below are descriptions of the imaging tests available at Desert Springs Hospital. An x-ray image is produced when a small amount of radiation passes through the body to expose sensitive film on the other side. The ability of x-rays to penetrate tissues and bones depends on the tissue's composition and mass. The difference between these two elements creates the images. The chest x-ray is the most common radiologic examination. Contrast agents, such as barium, can be swallowed to highlight the esophagus, stomach, and intestine and are used to help visualize an organ or film. Interventional radiology includes procedures done by an interventional radiologist who uses image guidance methods to gain access to vessels and organs. Interventional radiologists can treat certain conditions through the skin (percutaneously) that might otherwise require surgery. The technology includes the use of balloons, catheters, microcatheters, stents and therapeutic embolization (deliberately clogging up a blood vessel). The specialty of interventional radiology overlaps with other fields including interventional cardiology, vascular surgery, endoscopy, laparoscopy and other minimally invasive techniques, such as biopsies. Specialists performing interventional radiology procedures today include not only radiologists but also other types of physicians such as general surgeons, vascular surgeons, cardiologists, gastroenterologists, gynecologists and urologists. Ultrasound or sonography, uses high frequency sound waves to see inside the body. A device that acts like a microphone and speaker is placed in contact with the body using ultrasound gel to transmit the sound. As the sound waves pass through the body, echoes are produced and bounce back to the transducer. These echoes can help doctors determine the location of a structure or abnormality, as well as information about its make up. Ultrasound is a painless way to examine internal organs such as the heart, liver, blood vessels, breast, kidney or gall bladder, and is most commonly known for its ability to examine a fetus in the mother’s womb. Computed tomography, or CT, shows organs of interest at selected levels of the body. They are visual equivalent of bloodless slices of anatomy, with each scan being a single slice. CT examinations produce detailed organ studies by stacking individual image slices. CT can image the internal portion of organs and separate overlapping structures precisely. The scans are produced by having the source of the x-ray beam encircle or rotate around the patient. X-rays passing through the body are detected by an array of sensors. Information from the sensors is computer processed and then displayed as an image on a video screen. MRI produces images that are the visual equivalent of a slice of anatomy. MRI, however, is also capable of producing those images in an infinite number of projections through the body. MRI uses a large magnet that surrounds the patient, radio frequencies and a computer to produce images. As a patient enters a MRI scanner, their body is surrounded by a magnetic field up to 8,000 times stronger than that of the earth. The scanner subjects nuclei of the body's atoms to a radio signal, temporarily knocking select ones out of alignment. When the signal stops, the nuclei return to the aligned position, releasing their own faint radio frequencies from which the scanner and computer produce detailed images of the human anatomy. Patients who cannot undergo a MRI examination include those people dependent upon cardiac pacemakers and those with metallic foreign bodies in the brain or around the eye. Nuclear medicine uses very small amounts of radioactive materials or radiopharmaceuticals to diagnose disease. Radiopharmaceuticals are substances that are attracted to specific organs, bones, or tissues. The radiopharmaceuticals used in nuclear medicine emit gamma rays that can be detected externally by gamma cameras. These cameras work in conjunction with computers to form images that provide data and information about the area of body being imaged. The amount of radiation from a nuclear medicine procedure is comparable to that received during a diagnostic x-ray. Nuclear medicine imaging is unique in that it documents organ function and structure, in contrast to diagnostic radiology, which is based upon anatomy. It gathers medical information that may otherwise be unavailable without surgery or more expensive diagnostic tests. 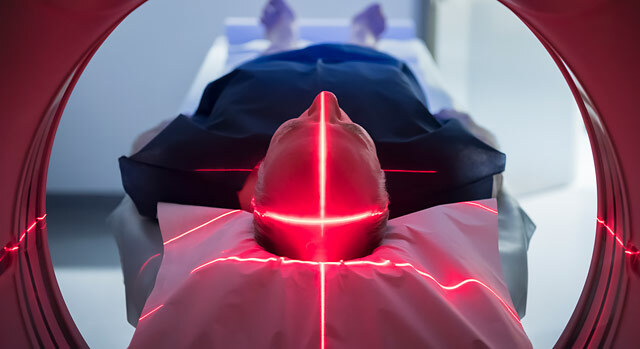 Nuclear medicine imaging procedures often identify abnormalities very early in the progression of a disease, long before some medical problems are apparent with other diagnostic tests. This early detection allows a disease to be treated early when there may be a more successful prognosis. Today, nuclear medicine offers procedures that are helpful to a broad span of medical specialties, from pediatrics to cardiology to psychiatry. There are nearly 100 different nuclear medicine imaging procedures available and there is not a major organ system that can not be imaged by nuclear medicine. If you need a referral for radiology or a physician at Desert Springs Hospital Medical Center, call our free physician referral service at 702-388-4888.